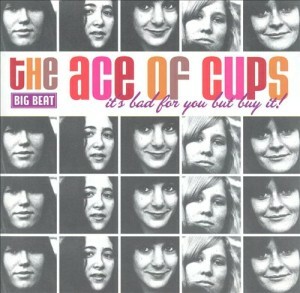 The Ace Of Cups appeared on the late-’60s San Francisco rock scene that became fairly popular in their area. The band played several shows in the Bay area, and occasionally ventured beyond. The Ace Of Cups even opened for big acts such as the Jefferson Airplane on occasion, further developing their reputation. One of the distinct features of the Ace Of Cups was that they were one of the few all-women self-contained rock bands of their time and style. The group never released anything while they were together, resulting in them fading into relative obscurity. The Ace Of Cups came together in Haight-Ashbury just as the psychedelic scene was taking off. They played mostly original material. Most of the band was involved in the songwriting process, and all the members sang. Denise Kaufman (guitar, vocals) did most of the writing and singing, and had previously sung and played harmonica on an obscure single from 1966 by Denise & Company. Kaufman was also the ex-girlfriend of future Rolling Stone magazine co-founder Jean Wenner. The Ace Of Cups were initially managed by Ambrose Hollingsworth, manager of Quicksilver Messenger Service. Hollingsworth became disabled due to a car accident, so Ron Polte took over as manager for both bands. Although the Ace Of Cups were relatively popular in the Bay area, and even received a plug from Jimi Hendrix in Melody Maker magazine, the band never landed a record deal. Why they didn’t sign a deal is unknown, as offers were presented by Warner Bros., Capitol, and Fantasy. Marla Hunt (keyboards) also said that legendary manager Albert Grossman was interested in signing the band, but his offer was turned down by Polte. Also, some of the band members were starting families, and were therefore reluctant to tour in support of their records. The Ace Of Cups did provide backing vocals for a number of bands, but their own material remained unreleased. Once the 1970s came along, the band started to lose momentum as members began to drift away. There were so many changes to the line-up that there were three men in the band at one time. Finally in 1972, the Ace Of Cups disbanded. In 2003, a collection of rehearsals, demos, TV sound stages, and in-concert tapes were gathered together and released on It’s Bad For You But Buy It! From the 2003 compilation It’s Bad For You But Buy It!